Scientists have monitored geologic unrest in the Long Valley, California, area since 1980. In that year, following a swarm of strong earthquakes, they discovered that the central part of the Long Valley Caldera had begun actively rising. Unrest in the area persists today. The U.S. Geological Survey (USGS) continues to provide the public and civil authorities with current information on the volcano hazards at Long Valley and is prepared to give timely warnings of any impending eruption. In the 1850's, gold fever brought the first waves of European settlers through the Long Valley area of eastern California. Today, thousands of visitors are attracted to the area year round by the spectacular mountain scenery of the eastern Sierra Nevada. This landscape has been sculpted over the past 4 million years by glaciers, earthquakes, and volcanic eruptions. About 760,000 years ago a cataclysmic volcanic eruption in the area blew out 150 cubic miles of magma (molten rock) from a depth of about 4 miles beneath the EarthÍs surface. Rapidly moving flows of glowing hot ash (pyroclastic flows) covered much of east-central California, and airborne ash fell as far east as Nebraska. The EarthÍs surface sank more than 1 mile into the space once occupied by the erupted magma, forming a large volcanic depression that geologists call a caldera. Much of the Long Valley area of eastern California is covered by rocks formed during volcanic eruptions in the past 2 million years. A cataclysmic eruption 760,000 years ago formed Long Valley Caldera and ejected flows of hot glowing ash(pyroclastic flows), which cooled to form the Bishop Tuff. Wind-blown ash from that ancient eruptionwhich was more than 2,000 times larger than the 1980 eruption of Mt. St. Helens, Washington, that killed 57 people and caused several billion dollars in damage&emdash;covered much of the Western United States. The photo shows a volcanic cone (Panum Dome) formed by eruptions about 600 years ago at the north end of the Mono Craters. The most recent volcanic eruptions in the area occurred in Mono Lake sometime between the mid-1700's and mid-1800's. Today, Long Valley occupies the eastern half of this 10-mile-wide, 20-mile-long caldera. Magma still underlies the caldera and heats underground water. The heated water feeds local hot springs and natural steam vents and drives three geothermal power plants, producing a combined 40 megawatts of electricity. The Long Valley Caldera is only one part of a large volcanic system in eastern California that also includes the Mono-Inyo Craters volcanic chain. This chain extends from Mammoth Mountain at the southwest rim of the caldera northward 25 miles to Mono Lake. Eruptions along this chain began 400,000 years ago, and Mammoth Mountain itself was formed by a series of eruptions ending 50,000 years ago. The volcanic system is still active. Scientists have determined that eruptions occurred in both the Inyo Craters and Mono Craters parts of the volcanic chain as recently as 600 years ago and that small eruptions occurred in Mono Lake sometime between the mid-1700's and mid-1800's. Although no volcanic eruptions are known to have occurred in eastern California since those in Mono Lake, earthquakes occur frequently. These earthquakes are caused by movement along faults and by the pressure of magma rising beneath the Earth's surface, two closely related geologic processes. In 1872, the magnitude 7.6 Owens Valley earthquake was felt throughout most of California, and a number of moderate (magnitude 5 to 6) earthquakes have shaken the Long Valley area during this century. 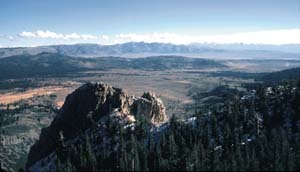 A period of ongoing geologic unrest in the Long Valley area began in 1978, when a magnitude 5.4 earthquake struck 6 miles southeast of the caldera. This temblor ended two decades of low quake activity in eastern California. The area has since experienced numerous swarms of earthquakes, especially in the southern part of the caldera and the adjacent Sierra Nevada. Earthquake activity in the Long Valley area of eastern California increased greatly after 1978. This volcanically active area is located along the major faults (black lines) that form the eastern edge of the Sierra Nevada. The quake activity is caused by two closely related geologic processesmovement along faults and the pressure of magma (molten rock) rising beneath the Earth's surface. Following four strong magnitude 6 shocks in May 1980, the U.S. Geological Survey (USGS) detected dome-like swelling in the middle of Long Valley Caldera (inset graph). In response to these signs of renewed volcanic unrest, USGS scientists intensified their monitoring of the Long Valley area. The most intense of these swarms began in May 1980 and included four strong magnitude 6 shocks, three of which struck on the same day. Immediately following these shocks, scientists from the U.S. Geological Survey (USGS) began a reexamination of the Long Valley area and detected other evidence of unresta dome-like uplift in the caldera. Their measurements showed that the center of the caldera had risen almost a foot since the summer of 1979, after decades of stability. This continuing swelling, which by early 2000 totaled nearly 2.5 feet and affects more than 100 square miles, is caused by new magma rising beneath the caldera. In response to this escalating geologic unrest, the USGS intensified its monitoring program in the Long Valley Caldera and Mono-Inyo Craters volcanic system. An expanded network of seismometers installed in 1982 closely monitors earthquake activity in the area, and other instruments track the continuing swelling in the caldera. Data from these instruments help scientists to assess the volcano hazards in the Long Valley area and to recognize the early signs of possible eruptions. In cooperation with the California Office of Emergency Services and civil authorities in eastern California, the USGS has established procedures to promptly alert the public to a possible eruption. TYPICAL BEHAVIOR: Since 1980, typical background geologic activity in the Long Valley area has included as many as 20 earthquakes of magnitude 2 or smaller a day, occasional swarms of magnitude 3 and larger earthquakes (felt locally), and uplift of the center of Long Valley Caldera at a rate of about 1 inch per year. Swarms including magnitude 4 earthquakes may occur about once a year. ROUTINE MONITORING: When appropriate, information calls placed to USGS personnel, Town, County, and State (OES, California Division of Mines and Geology) authorities, and locally operating Federal agencies (U.S. Forest Service, Bureau of Land Management) regarding felt earthquakes and notable changes in other types of geologic activity, such as ground deformation, volcanic gas emissions, and fumarolic activity. INTENSE UNREST (may occur about once a decade): For example, a quake swarm with at least one magnitude 5 earthquake and (or) evidence of increased magma movement or pressure at depth, as indicated by a pronounced increase in the rate of ground deformation. INTENSIFIED MONITORING. Set up emergency field headquarters in the Long Valley area. WATCH message sent by USGS to California OES, which promptly notifies local authorities. ERUPTION LIKELY within hours or days (may occur every few hundred years): Strong evidence of magma movement at shallow depth. GEOLOGIC HAZARD WARNING issued by USGS to Governors of California and Nevada and others, who inform the public. Continue intensive on-site monitoring. SUSTAINED MONITORING AND COMMUNICATION. Maintain intensive monitoring and continuously keep civil authorities informed on progress of eruption and likely future developments. The U.S. Geological Survey (USGS), in cooperation with the California Office of Emergency Services (OES) and local authorities, has established these procedures to respond to different levels of geologic unrest in the Long Valley area of eastern California. During the early 1990's, trees began dying off at several places on Mammoth Mountain on the southwest edge of Long Valley Caldera. Studies conducted by USGS and U.S. Forest Service scientists show that the trees are being killed by large amounts of carbon dioxide (CO2) gas seeping up through the soil from magma deep beneath Mammoth Mountain. Such emissions of volcanic gas, as well as earthquake swarms and ground swelling, commonly precede volcanic eruptions. When these events precede an eruption of a "central vent" volcano, such as Mount St. Helens, Washington, they normally last only a few weeks or months. However, such symptoms of volcanic unrest may persist for decades or even centuries at large calderas, such as Long Valley Caldera. Recent studies indicate that only about one in six such episodes of unrest at large calderas worldwide actually culminates in an eruption. Over the past 4,000 years, small to moderate eruptions have occurred somewhere along the Mono-Inyo volcanic chain every few hundred years, and the possibility remains that geologic unrest in the Long Valley area could take only weeks to escalate to an eruption. Nonetheless, geologists think that the chances of an eruption in the area in any given year are quite small. To provide reliable and timely warning prior to an eruption, scientists of the USGS Volcano Hazards Program continue to closely monitor geologic unrest in the Long Valley area of eastern California and in other volcanic regions of the United States, including Hawaii, the Pacific Northwest, Wyoming, and Alaska. This ongoing work helps to better protect peoples lives and property from volcano hazards. Future Eruptions in California's Long Valley AreaWhat's Likely?